If you haven’t seen a Gilbert and Sullivan before, “The Pirates of Penzance” is probably the most popular and well known of the comic operettas. Although written a long time ago, with the premier performance in New York back in 1879, it remains an amusing, lively, entertaining and enjoyable show for audiences of all ages. TMTG has had some fun with their adaption of the story, adding in a few extra characters and borrowing the odd song or two from other shows to go with the classics like “Cat Like Tread’ and the Policeman’s Song’ (a policeman’s lot is not a happy one). We’ve even added a touch of ballet! You are in for a real treat, so bring the whole family there will be something to appeal to everyone. Why not enter the children’s Best Dressed Pirate competition on the Saturday Matinee. As usual, TMTG has assembled a strong cast for the show featuring; Mark Collins as the Pirate King, Richard and Kayley Prior as Frederick and Mabel and David Walker as the Major General. Please select the ‘Cast’ button on this website to find out more about those in the show, and hit ‘Get Tickets’ for ticket information. The story revolves around a band of pirates, who are rather soft hearted… or just soft in the head, especially when it comes to orphans, who they are themselves! The hopeless comrades are led by their captain “The Pirate King”. Frederick, is an apprentice pirate, who, on reaching twenty one, will be released from his apprenticeship and intends to leave his shipmates. For the first time in his life he meets some beautiful young ladies and takes a particular interest in Mabel, falling instantly in love with her. However, Frederick has a problem. Finding out that he was born on 29 February, he technically, only has a birthday each leap year. His apprenticeship indentures state that he remains apprenticed to the pirates until his 21st birthday, and so he must serve for another 63 years! Bound by his own sense of duty, Frederick's only solace is that Mabel agrees to wait for him faithfully. Mabel and the other young ladies are all daughters of Major-General Stanley. The pirate gang try to abduct all the young ladies with the intention of marrying them. But the Major General pleas for their release claiming that he himself is an orphan and would be lonely without them. The plot develops with the pirates coming to attack the Major General when they realise he has lied to them. But the Major General and Frederick engage the local police constabulary, the weakest and most ineffective bunch around, to fight off the pirates. Chaos ensues! Sit back enjoy the ridiculous plot, the wonderful melodies, the fighting, the flirting, the quaking in the boots and of course the happy ending! Well what a week! One sell out performance with the rest not far behind at all! 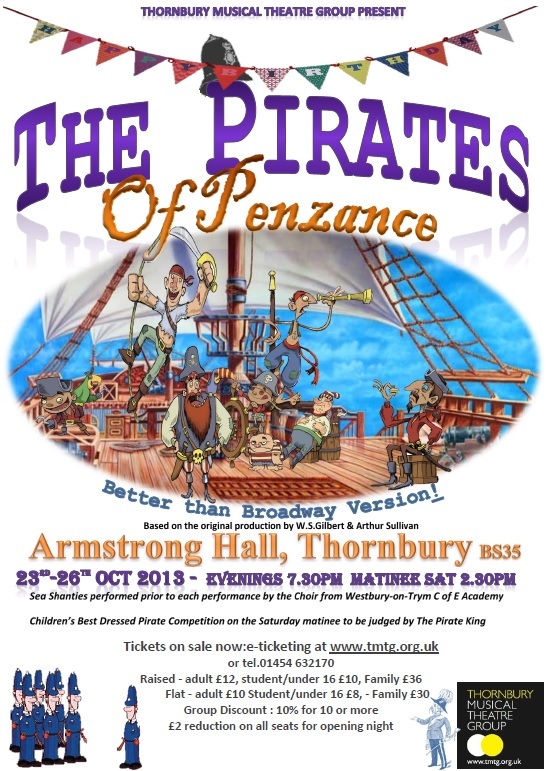 We know from all your lovely comments that our audiences loved Peter Berry's take on 'The Pirates of Penzance' and for those who missed it we have another great show coming soon! If you were there tell us about it in our "Guest Book" using the link above. We never let the grass grow under our feet at TMTG and Lizzie Lindsell is just putting the finishing touches to her pantomime script 'Rapunzel' which she will also be directing. Tickets are now available for our next production at the Armstrong Hall, Thornbury, with evening performances daily at 19:30 and a 14:30 matinee on Sat 26th Oct. Please just hit the “get tickets” button above to get your tickets, which start at just £6. The show, based on the traditional Gilbert and Sullivan production, has been radically adapted by TMTG to bring it up to date and to be appealing to a wide audience. Look out for the special first night discounts, a best dressed pirate competition and enjoy traditional sea shanties before the start of each show. Congratulations to Kayley Prior who has received a Rose Bowl nomination for the Melanie Evans Best Actress (Musical) award for her role as Mabel in our 2013 production of 'The Pirates of Penzance'. The awards ceremony is on 19th October at the Winter Gardens, Weston Super-Mare when we find out if we have won. The stunning set for “The Pirates of Penzance” is nominated for the Wilfred Roe Trophy for stage decor. Congratulations to set designer David Wrench and construction manager Paul Dolan and their team. The winners will be announced at the awards ceremony at St Mellion on 1st March. Good luck all! What a fantastic show! Congratulations to all involved. It was the whole cast together, and their evident enthusiasm and enjoyment, which made the show a real pleasure to watch. Read more about Fantastic Show! I think the audience reaction at the end of the show was proof that you had a hit on your hands. And quite rightly too. The achievement is to be commended with both staging and performance and also with the backing of a fine orchestra. This was Pete Berry’s directorial debut and what a brave man he was to give the company the challenge of a G&S, which was a genre very few had previously experienced. Musical Director Roger Winter had created some lovely arrangements, the numbers were taken at a good pace, but not so fast that you could not hear the words.